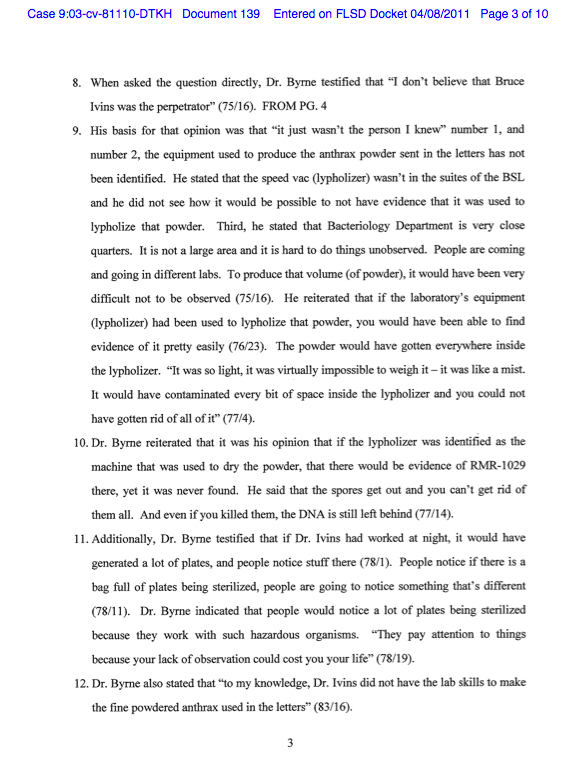 2011 April « CASE CLOSED … what really happened in the 2001 anthrax attacks? 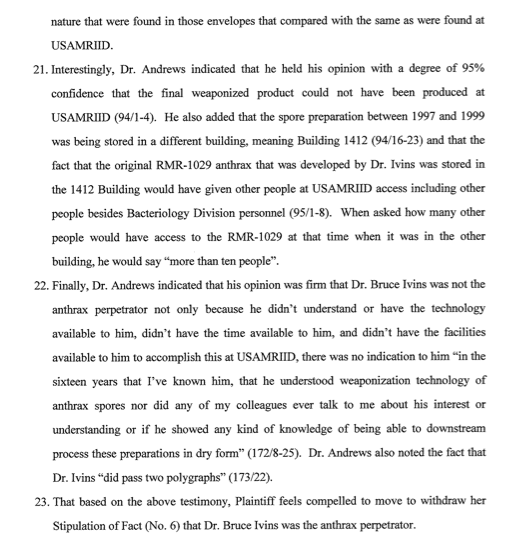 Add Maureen Stevens to the list of people who don’t believe troubled federal biodefense researcher Bruce Ivins killed her husband and four others in the 2001 anthrax attacks. Maureen Stevens’ attorneys originally agreed to accept the findings of the estimated $100 million FBI investigation. But when Ivins’ bosses at the military lab in Maryland insisted under oath that he lacked the time, equipment and know-how to produce the anthrax, the attorneys said they could no longer accept the findings. 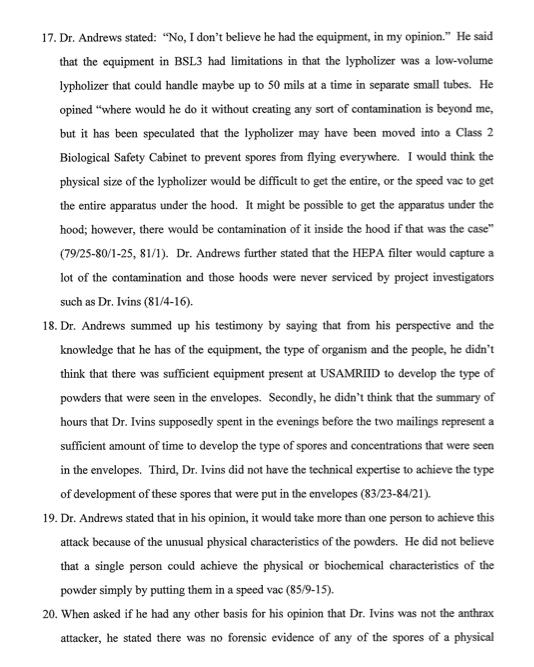 he would have left evidence … anthrax dust would have covered the machine he (was alleged) to use to produce the powder. 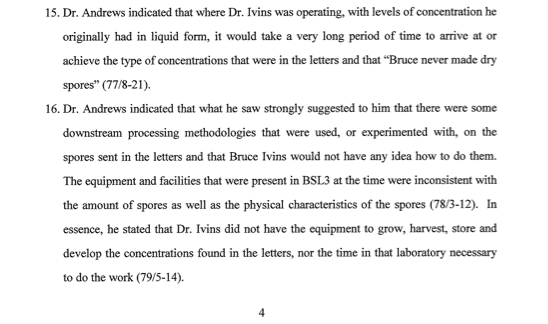 Dr. Ivins did not have the lab skills to make the fine powdered anthrax used in the letters. the FBI grossly underestimated the time it would take to produce the amount of anthrax used in the letter attacks. someone would have had to help him. In other words, there is no case against Dr. ivins. 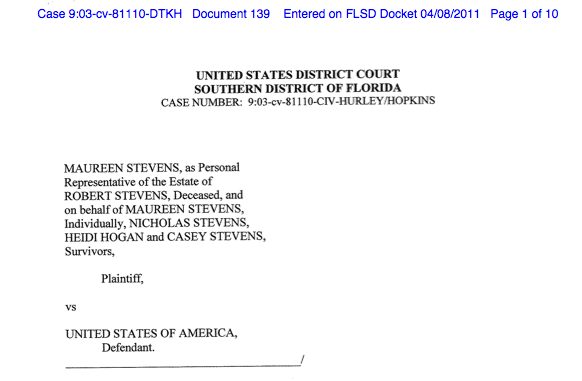 The Stevens’ law suit against the U.S. government is an opportunity to demonstrate that in a court of law, something the FBI conveniently by-passed by charging a dead man who could not defend himself. 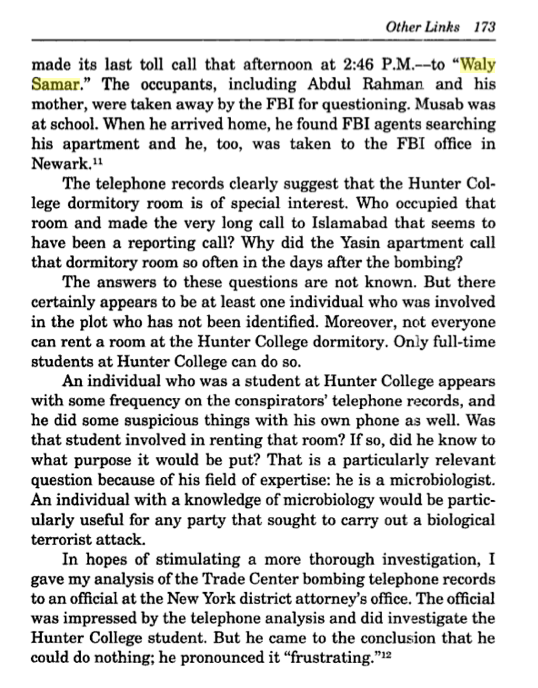 * Laurie Mylroie in a 2001 book described a “Waly Samar” who was a microbiologist connected to the WTC 1993 participants based on phone records. 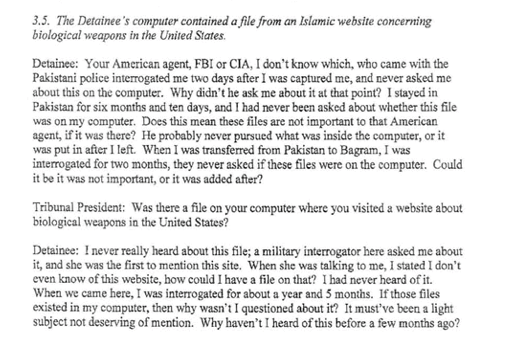 Was he the subtilis expert allegedly connected to Al Qaeda’s anthrax program that the FBI reports it was able to confidently exclude (in adjudging Dr. Ivins the sole culprit)? Did “Waly Samar” live in Trenton in 2001? 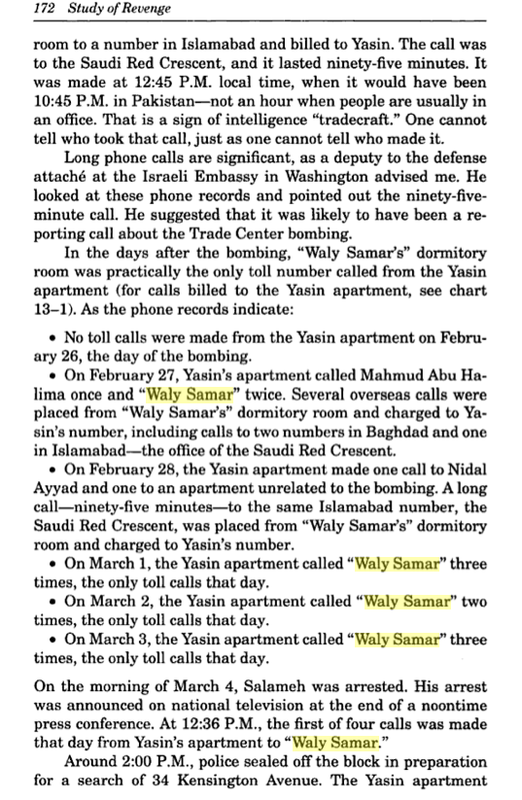 Who does “Waly Samar” think is responsible for the Fall 2001 anthrax mailings? * The FBI has previously explained that it ruled out various scientists alleged to have connections to Al Qaeda and Ansar Al-Islam and/or its anthrax program. 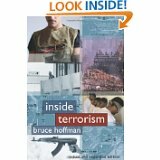 Among those who the FBI is confident could be excluded, is Najmut Tariq the “foreign-born scientist with particular expertise working with a Bacillus anthracis simulant known as Bacillus subtilis, and against whom there were allegations that s/he had connections with several individuals affiliated with the al-Qaeda and Ansar al-Islam terrorist networks”? Or is that someone else? 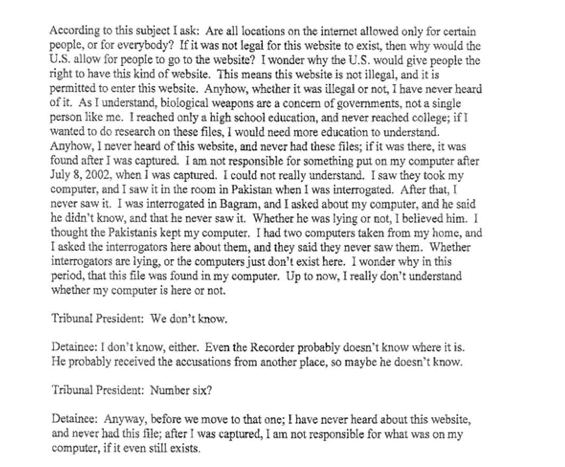 * What does Najmut Tariq say about suggestion that his name on a document links to him the anthrax vaccine and biological weapons. 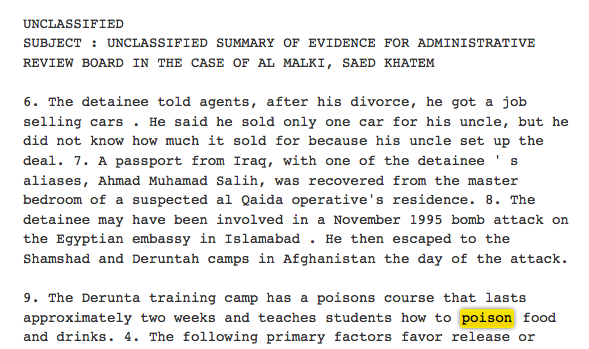 Was his pharmaceutical business simply where Al Qaeda hoped to purchase items such as Cipro? 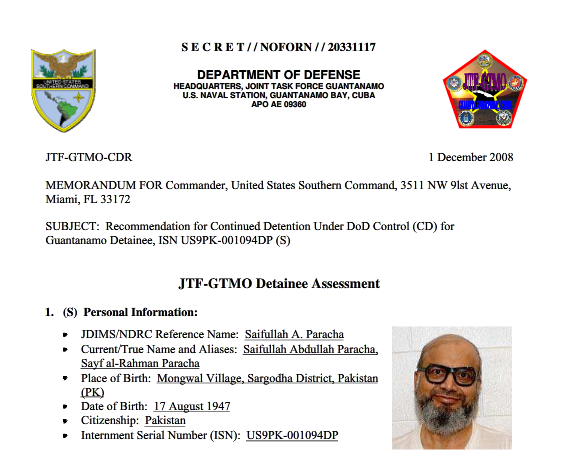 * Wikileaks / Guantanamo – Mammar Ameur gave spirited defense to suggestion he had visited an islamic website concerning biological weapons in the United States. 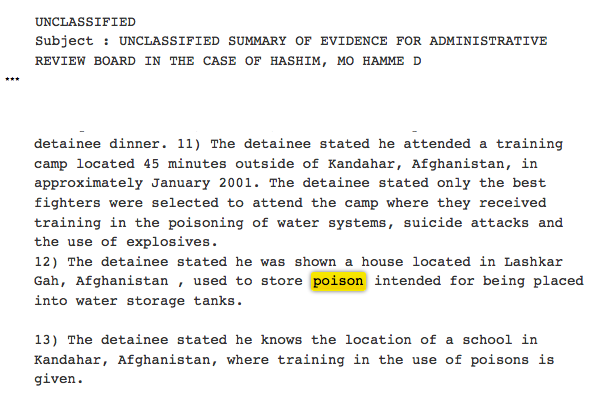 * What was the name of the school in Kandahar where training in the use of poisons was given? * Wikileaks / Guantanamo: At Darunta training camp, what poison was involved in the two week poisons course that taught students how to poison food and drinks?